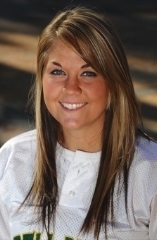 April 7, 2009Belhaven College senior Mallory Meadows was recently named Gulf Coast Athletic Conference Player of the week for her efforts on the softball field during the week of March 30th through April 5th. Meadows, a native of Daphne, Alabama, had a batting average of .333 with a slugging percentage of.833. She drove in a total of seven runs and had a pair of key home runs which helped the Lady Blazers sweep a doubleheader from 10th ranked University of Mobile on Saturday, April 4th. Meadows also earned a pitching victory for Belhaven by tossing 5.2 innings against Mobile in game one of the doubleheader. The win was her fifth on the season against just one loss. To see more stories on the Lady Blazers softball team or to see their game schedule, visit the Belhaven Blazers Athletic website.